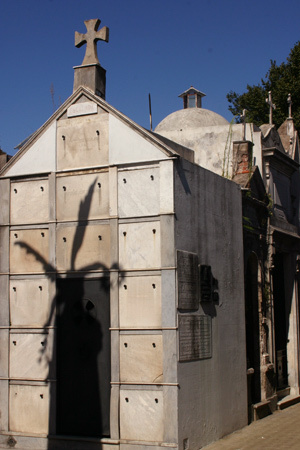 Here lies Sir Francisco Antonio de Escalada, who served his nation in the most serious & honorific duties. He solemnly proclaimed its independence & deserved the love & respect of his fellow patriots for his righteousness, unselfishness & religious nature, passing away at 86 years of age on December 7, 1835. 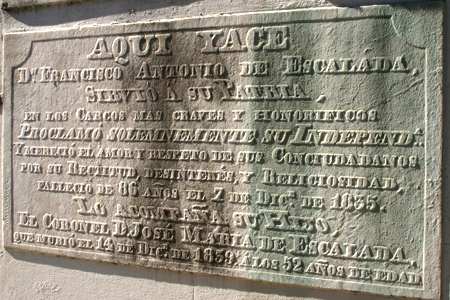 His son accompanies him, Coronel José María de Escalada, who died December 14, 1839 at 52 years of age. 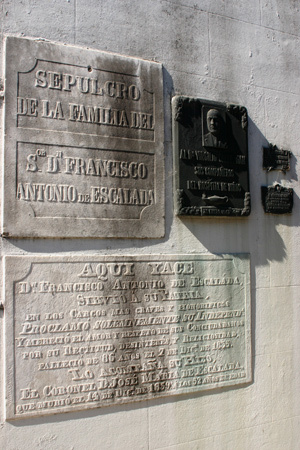 The last name may sound familiar to some, but according to the fantastic resource Geneología Familiar Francisco Antonio was not directly related to the wife of José de San Martín. For anyone interested in the relations between all the early, upper-class families of Argentina, the above link will be fascinating.